Latin America Amateur Championship Golf to Air Live on ESPN Networks - ESPN Press Room U.S. The top amateur golfers from South and Central America, Mexico and the Caribbean will compete with big rewards on the line in the fifth annual Latin America Amateur Championship this weekend and golf fans in America can watch all four rounds of play live on ESPN networks. Held at Casa de Campo’s Teeth of the Dog course in the Dominican Republic, the event begins Thursday, Jan. 17, and concludes Sunday, Jan. 20. Two hours of live play per day will air on ESPN2 (Jan. 17, 18 and 20) or on ESPNEWS (Jan. 19), with the telecasts also available on the ESPN App. The event was created in 2014 by the Masters Tournament, the R&A and the USGA to further develop amateur golf throughout the region. The winner of the tournament receives an invitation to compete in the Masters Tournament, an exemption into The Amateur Championship, conducted by the R&A, and an exemption into the U.S. Amateur Championship and any other USGA amateur championship for which the winner is eligible. 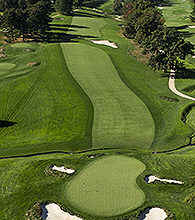 In addition, the champion and runner-up receive an exemption into The Open Qualifying Series – Final Qualifying, with an opportunity to earn a place in The 148th Open at Royal Portrush, and an exemption into sectional qualifying for the U.S. Open with an opportunity to earn a place in the 2019 U.S. Open at Pebble Beach. Rich Lerner will anchor the ESPN telecasts, joined for analysis by two-time U.S. Open champion Andy North. Dottie Pepper and Paul Gow will report from the course and John Sutcliffe will conduct player interviews. All programs also available on ESPN App.